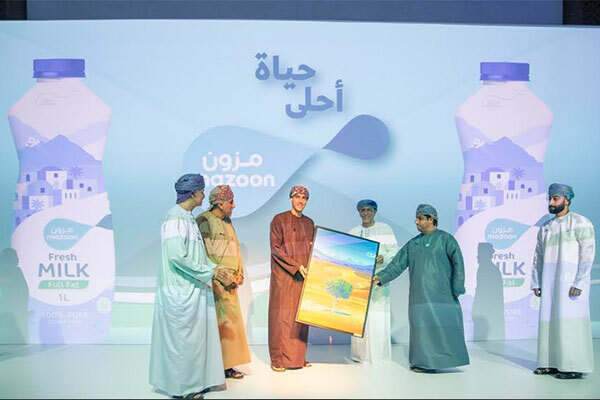 Mazoon Dairy Company, the flagship dairy company of Oman, has unveiled a striking visual identity that reflects the vibrant, progressive and dynamic characteristics of Omani society. Mazoon Dairy recognizes dairy as a ‘Force of Nature’, a company statement said. It aims to unlock this force in people through its visual identity to nourish a better tomorrow. The lively and youthful packaging and design promises to deliver a warm and an empathetic brand that understands what people need to live a healthy and active life. The brand logo symbolizes unceasing development and stirs a spirit of success among the Omani youth. It represents the strong bond between generations in Oman. The visual identity was revealed in the presence of Sayyid Kamil bin Fahd bin Mahmoud Al Said, Assistant Secretary General of the Office of Deputy Prime Minister for the Council of Ministers. Dr Rashid bin Salim Al Masrouri, chairman Mazoon Dairy said: “We are proud to unveil Mazoon’s brand identity that is part of an exciting wave of progressive economic diversification in the Sultanate that reflects a ‘new’ Oman. Dr Arjun Subramanian, the CEO of Mazoon Dairy, added: “The launch of our visual identity is a significant milestone in our journey to establish a homegrown dairy business in Oman. The brand and the packaging will proudly reflect its Omani heritage and will enable people to make the right choices for a healthy and active lifestyle. Mazoon Dairy is due to commence production in 2019 with the objective to produce over 200 million litres of milk by 2026 and increase capacity to over 900 million litres by 2040. Once the dairy facility is fully operational, it will provide quality home-produced dairy and juice products, including milk, yoghurt, laban, fresh cream, cheese and ice cream.